" Songbirds are little hidden gems of nature. They can bless us so much, and we often never notice them. 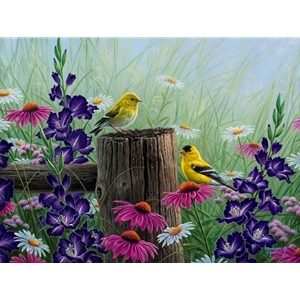 Goldfinch Meadow is the first painting in my new series called Feathered Friends! I am so excited to share these paintings with you! In my part of the country, we get a lot of goldfinches. So its only fitting that goldfinches kick off the series! I remember one day that I had my thistle seed feeders out in front of my window, and dozens of these bright yellow birds came in! One of the most amazing things I've ever seen! I decided to combine a pair of these cute little birds with a few of the many flowers we grew in our garden at the time. Every time I look at this painting, I think of all the hours I spent snapping pictures of these birds, and trying to keep the squirrels from destroying my feeders. I hope you enjoy this painting, and stay tuned for more in the Feathered Friends series!" Goldfinch Meadow will be released in only one size with no Publishers Proof edition making it a very rare release.! .